HP Officejet 8000 - A811a,HP OfficeJet Pro 8000,HP 8000 Wireless,HP 8500,HP 8500A,HP 8500 - A909a, 8500A - A910a,HP 8500A Plus - A910g,HP 8500A Premium - A910n,HP 8500 Premier,HP 8500 Premier - A909n,HP 8500 Wireless,HP 8500 Wireless - A909g. 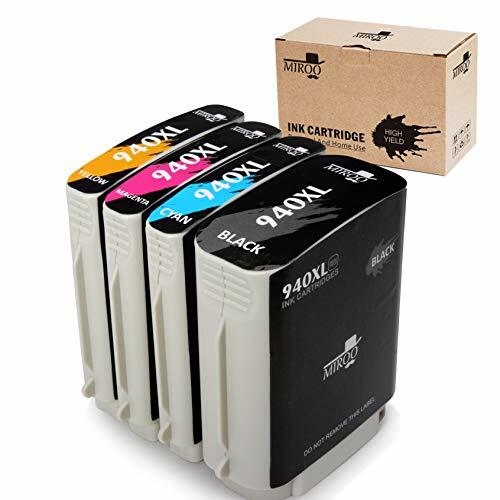 All of our cartridges are protected in an individual plastic bag,very convenient for storage, include in the box:1x Black, 1x Cyan, 1x Magenta, 1x Yellow Total 4-pack. Ink Volume : Black:69ml Cyan/Magenta/Yellow:28ml Page Yield: Black: up to 2,300 Pagesat 5% coverage Cyan/Magenta/Yellow: up to1,500 Pages at 5% coverage. At MIROO, we believe in our products. That's why we back them all with an 24-month warranty and provide friendly, easy-to-reach support. Please find your order and click 'Contact Seller',then you can send Email to us ,we will reply you in less than 24 hours. • Please confirm your Printer Model before placing order. • Do not need tear the plastic film before install the ink . • Please clean the printer heads everytime you change ink,That more than anything will keep your printer running smoothly. • The computer would appear Non-Genuine, please click Yes continuously, then the printer can go on to print. • If you receive the ink can not recognize your printer please turn off 30 second then turn on and install again ,also you can try take the ink out and use tissue with rubbing alcohol clean the chips softly. Please do not hesitate contact our customer service for any requirement. Printer compatibility: 940XL Ink Cartridge use on HP Officejet Pro 8000,HP Officejet Pro 8500,HP Officejet Pro 8500A,HP Officejet Pro 8500A Plus printer,machine model: A809a A811a A909a, A909g A909n A910a A910g A910n. High Page Yield: black up to 2,300 Pages & 1,500 pages per color cartridge 5% coverage. Why Choose Miroo: leading company in new technology for cartridges, focus on quality to provide best product to our customer, competitive price only 20% of the price of the major brands. Why pay more to have the same product and service? Miroo Go. Include In The Package: 1 black, 1 cyan, 1 magenta, 1 yellow, total 4-pack. Ink Volume: Black 940xl 69ml;Cyan,Magenta,Mellow 940XL 28ml each. If you have any questions about this product by MIROO, contact us by completing and submitting the form below. If you are looking for a specif part number, please include it with your message.